Representing the spirit of DP World, Patrick Bol has formed a team of rowers; Lewis Knollman, Andrew Ruinoff, and Matt Wilds to cross the Atlantic Ocean in 27 days or less to collect samples of water and draw attention to the plastic pollution problem – smashing world records along the way. After a memorable send-off in Dakar, Senegal. Patrick Bol along with his team of Lewis Knollman, Andrew Ruinoff, and Matt Wilds have started their Atlantic row record attempt. 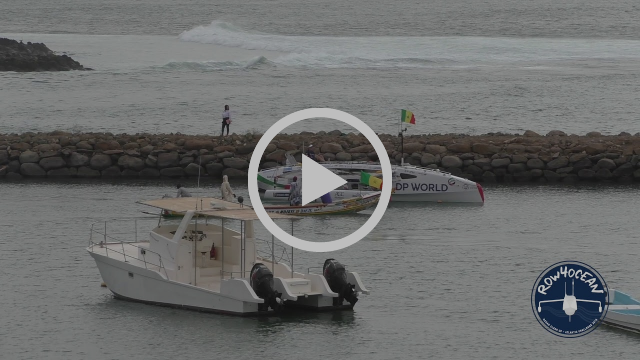 Hundreds of well-wishers attended the start of the epic journey as the Row4Ocean team sprinted past the breakwater of the Terrou-bi Hotel and Resort and into the open waters of the Atlantic Ocean. Row4Ocean aim to cross the Atlantic Ocean in 27 days or less and collect samples of water and draw attention to the plastic pollution problem – smashing world records along the way. The ROW4OCEAN team will be sending regular reports from the Atlantic Ocean via satellite link.